Victor Grossman’s new Monthly Review Press book, A Socialist Defector: From Harvard to Karl-Marx-Allee, is now on sale. The book reflects many of Grossman’s experiences and ideas on past and present. 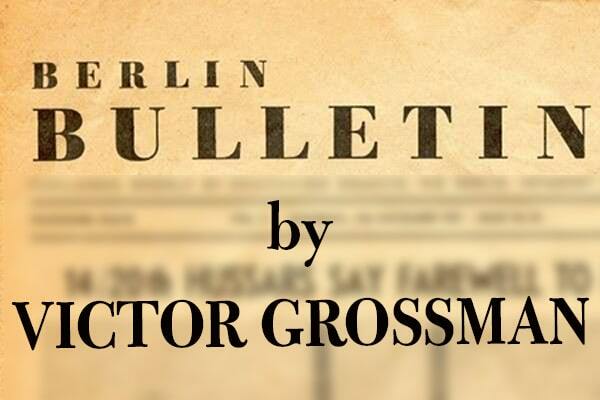 Grossman will be on book tour in New York, Washington and Boston in May; Los Angeles and San Francisco in June; and Chicago and the Midwest. Please contact Monthly Review Press (Comment for MR or MR Press editors) if you are interested in hosting an event. There have already been attempts to commercialize it, á la Mother’s and Father’s Day. But maybe not here at Alex, I reflected: perhaps more would now hear of the German Socialist (and later Communist) Clara Zetkin, a champion of women’s rights (and for all working people), who played a major role in getting a special day of militancy designated in Copenhagen in 1910. A few might even learn of its inspiration—a strike by ten thousands of brutally exploited needle-trades workers in New York in 1908, mostly Jewish immigrant women, who defied weeks of hunger and police violence. Frankly, I expected a rally like so many I had joined: for Mumia Abu Jamal, the Easter Peace Marches against war and weapon shipments, against a Trump-Bolton-Adams putsch against Venezuela—with many recognizable friends and fellow fighters, the dedicated “old faithful”, often well-on in years—a courageous bunch but far too few! Then—what a surprise! The wide square was jammed with thousands and thousands, mostly young women, maybe 20 % young males, and only a light seasoning of grayheads and graybeards. During an hour’s wait before marching off with sound trucks and big banners I squeezed through the crowd, hunting for a familiar face. I finally found another old-timer, a refugee from Pinochet’s Chile who settled here. Always active, she was currently busy fighting right-wing attempts to seize Berlin’s Venezuelan Embassy. But she took part today, and we were glad to meet. One of course was Theresa May, talking herself hoarse in harried attempts to save her party, her country and her job as prime minister. Visits to this town would be to seek ways of slipping less painfully out of a European Union dominated by its strongest member, Germany, which is not overly eager to help her out of the schlimazel—and perhaps become a pacemaker for other EU deserters. As for that bunch, their leaders, male or female, were the last ones to be expected on Women’s Day even though Alice Weidel, head of the Alternative for Germany (AfD) caucus in the Bundestag, lives and raises two sons with a woman partner from Sri Lanka. But her party denounces same-gender marriage and abortion rights (and higher taxes for the wealthy). Its speeches drip with hatred toward the “take-over” of Europe by nasty Muslims but praise Germany’s past greatness before losing the War. But Weidel and two male party leaders are now busy fighting charges of fraud—accepting illegal donations from shady donors in Switzerland and elsewhere. Nobody missed them at Alex. But they still get 12-14% in the polls and threaten to gain new strength in the May and September elections. Deploring the stagnation of the Left in the polls at 8-10% and its losses in eastern Germany, last September she and other prominent left-leaning people founded a new movement—“Aufstehen” (Stand Up). It sought to reach dissatisfied voters from different parties, even some who voiced their protest by choosing the alt-right AfD. Many party leaders, especially the so-called “moderates”, condemned the move and found that her words somehow seemed to echo the AfD stress on working people already in Germany, opposing the waves of refugees and immigrants. The arguments were heated; would this move succeed in gaining ground for the left or only further split its ranks? There have since been more rallies, at Alex and elsewhere in Berlin and Germany. School children skip classes on Fridays to demand immediate environmental action, another rally, defying miserable weather, opposed the racists in the shadow of the Christchurch killing. A strike by civil servants, from kindergarten teachers to garbage collectors, won a partial victory, a one-day warning strike stopped Berlin’s bus system. There’s plenty to fight about and people can be moved to action—hopefully with active participation of the Linke. The fight goes on—La lucha continua!